Looking for the best gear for your little one? 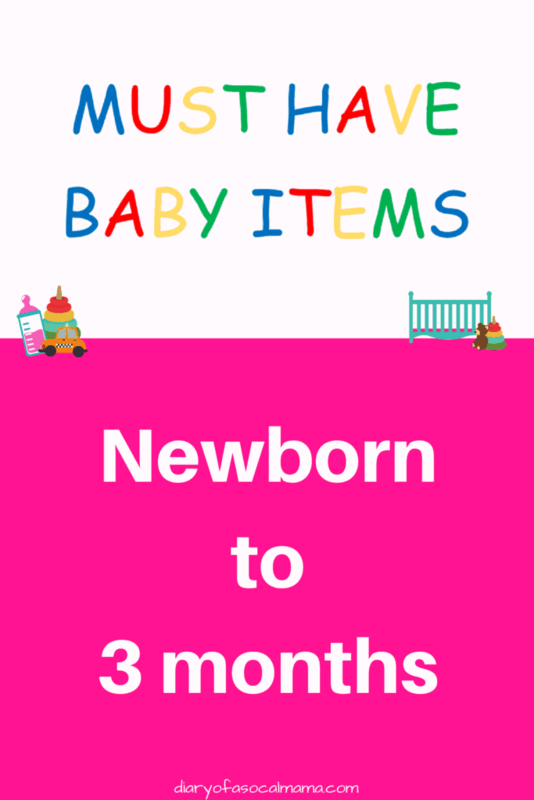 Check out this list of must have items for your newborn to 3 month old. The list is curated from items I personally used and loved and those that were popular with other moms and babies from my mom groups. These groups have 300+ moms so if our little ones liked them I’m guessing yours will too! To get started check out my list of the basic baby essentials. It’s a sad fact of life that as much as you try to protect your new little baby they will come into contact with germs and get sick. It’s awful seeing your little one sick and congested. In addition to taking them in a steamy bathroom a Nose Frida is an essential tool to surviving babies first cold. Check out my review of the Nose Frida here. Your baby spent the last 9+ months in a nice warm womb. They often refer to the first 3 months of life as the 4th trimester. Your baby may sleep easier if you can mimic this warm secure feeling by swaddling (it’s recommended to stop swaddling with arms in around 8 weeks as baby may begin to roll and you don’t want them trapped unable to use their arms.) My husband and I were amazed at the nice, tight swaddles the nurses in the hospital could get with just a blanket! We were never able to replicate that on our own but luckily there are products like the SwaddleMe which allow parents to cheat the system. These come with velcro pieces so that you can get a secure swaddles with minimal effort, exactly what every sleep deprived new parent needs. Another throwback to the womb is a sound machine. While inside baby heard the beating of mamas heart and the movement of fluids through the body. A white noise machine can help replicate this for baby and help them to sleep better. We love the Munchkin Nursery Projecter and Sound Machine and use the ocean and rain settings at our house. I was slightly concerned when I first got it as some of the Amazon reviews mentioned they die frequently. But, with a low price point and otherwise good reviews I decided to give it a shot. We’ve had ours for 6 months and it’s still going strong. Boppy pillows are essential for breastfeeding moms, and I hope you’re breastfeeding this early on if you’re able. They can also be a great tool for propping babies on in the early days. They also come with lots of different covers so you can pick one that matches your theme or decor. A baby monitor is an obvious essential for parents. That way you can safely monitor your little one without having to stay right by them. Even a sound only monitor can work ok, but I know most of us want video these days. I’ve heard too many stories about people hearing creepy things on their wifi monitors, plus the fact that they can be hacked. So it was important to me to get one that would not be attached to our wifi. We went with the Infant Optics DXR-8. It came highly recommended by other moms, got good reviews on tech sites, and let’s us have video coverage without being attached to wifi. We can’t see it on our iPhones but we rarely leave our daughter with a sitter so this isn’t such a big draw for us. The only con I’ve found is that the battery life isn’t great so if she takes a long nap I usually have to plug it in towards the end. Whether you’re using formula or pumped breast milk you’re likely to be using some bottles at some point in the first few months. You’ll find that the milk can leave a film on your bottles and pump parts. I tried the dapple bottle wash on the recommendation of other moms and I love this stuff! The bottles and parts come out literally squeaky clean. The ingredients are also baby friendly and the product was created by moms for moms. I generally grab mine at Target but you can also pick it up on Amazon for a little bit more. There seems to be some debate over whether or not a diaper genie is relevant or not. We liked ours so much we bought a 2nd one as our house is two stories. They make it easy to contain all the diapers and then we just empty them every couple days. It’s easier than running out to our the bins at our apartment complex all the time or having them sitting in our regular trash which doesn’t stay sealed as well. They even have customizable ones if you want to make it blend in with your decor. Your baby won’t need much entertainment in the early days. But, as they approach the 3 month mark and start being more aware of the world you may want to invest in an activity mat. The piano one seemed to be a big hit in my mom group though there are lots of different options. You can put your baby here and they will have lots to look at while they kick around and practice using those limbs they are just starting to discover. It also gives them a colorful place to do tummy time. I hope your little one loves these items as much as mine did. Be sure to check out my list of basic baby essentials that will fit any budget.